The ownership has also committed to create new job opportunities for not less than 300 Bahamians in the first phase of their operations and ultimately hopes Bahamians can qualify for 100 per cent of the 632 jobs on this Grand Bahama based ship serving the island exclusively from the Port of Palm Beach. Meanwhile, the Balearia – a $100 million new vessel – will arrive in Grand Bahama this weekend. Built in Spain four years ago, it is one of the newer of the vessels in the company’s fleet. 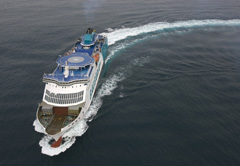 The superfast cruise ferry sails up to 23 knots in speed. Amenities include a full breakfast buffet restaurant, casino, a la cart restaurant, bars, entertainment for children, spa and a tropical pool bar on the upper deck. The ship has a capacity for 1,000 passengers and 200 containers. The ship sails from Freeport at 7:00 p.m. and from FLL at 8:00 a.m.
As a result of the new vessel, 30 new direct jobs in the Bahamas and 150 indirect jobs will be created. “The company is further solidifying its relationship and partnership with Grand Bahama Island by moving all call center sales from the US to Grand Bahama Island, supporting this MOT initiative. The call center presently employs 30 Grand Bahamians who are qualified to respond to queries about the Islands of The Bahamas as well as book air, now sea packages,” Prime Minister Christie said. “CEO Hernan Calvo thanks the Bahamas Government for the endless help and support that his company has received. He further states that any new ventures would not have been possible without the permanent support of the Ministry of Tourism. “The goal has always been to allow visitors a “Grand Experience” on Grand Bahama Island. It is clearly evident by the increase in investment; additional hotel rooms, new gateways from the US and Canada offering direct airlift and sealift, we are creating the perfect storm to guarantee “The Grand Life” to everyone visiting and living on Grand Bahama Island. Executive Vice President of Grand Celebration Glen Ryerson said the company is happy to launch the new cruise line. “This comes as a result of the wonderful work of the prime minister, the minister of tourism, the director general, the promotional board and so many others,” he said. Chief Executive Officer of Balaeria Bahamas Herno Caho also expressed his gratitude. “Our new vessel is right here in Grand Bahama. It’s a brand new vessel and it is one of the most modern vessels. It has the capacity for 1,000 and a $100 million investment,” he said. The new vessel will have new pools, a new casino and a spa. “We are improving our services and we are really glad to be here to bring a newer and bigger vessel. We hope to give life to the island and also all our passengers will come off and stay in Grand Bahama,” Mr. Caho said. The Balaeria will also have a package feature that will begin in January 2015.